Sure it’s artisanal, but can it handle my tuna salad? This loaf can. Roxana Jullapat is sipping a café de olla at La Monarca in Santa Monica when she pushes a loaf of bread across the table to me. I’d seen the thing on her social feed and needed to know more. Local? She baked it this morning in Silver Lake. Small batch? That, too. The Tehachapi Heritage Grain Project wheat was milled at Pasadena’s Grist & Toll. “One hundred percent whole meal, which is pretty impressive,” says Roxana, the pastry chef who ran Ammo and Cooks County with partner Daniel Mattern. Natural starter? Do you have to ask? It is the apotheosis of artisanal baking. What I may love most about it, though, is that this is a humble pullman loaf. Shaped like a brick and several shades darker, the pullman is baked in a rigid tin with a cover. Popularized by the railcar company in the late 19th century, the long rectangles maximized space in dining car kitchens and are a testament to industrial efficiency. That makes the loaves the opposite of the gorgeous oblong boules, artfully scored bâtards, and stone-milled pound cakes that typically catch my eye on Instagram, making me want to bite through the screen. 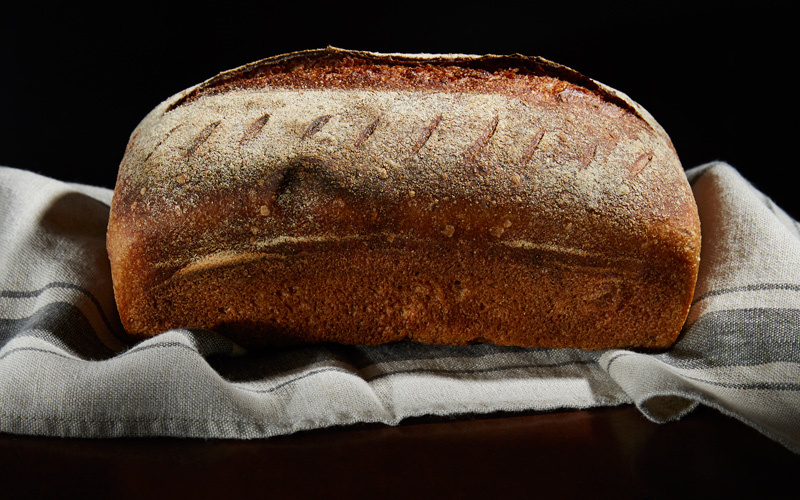 In a way all this bread is the culmination of a movement that started here in 1989, when La Brea Bakery transformed our expectations of the city’s bread with an expertly executed rosemary-olive oil loaf. Since then, home cooks have been trying to get ever closer to the source of baking. The high ridges still glazed with flour from the proofing baskets represent craft. The names of farmers behind the wheat speak of individuality. The use of ancient strains like einkorn and emmer—from wild grasses once gathered in the Fertile Crescent—transports us back to a common heritage. I understand the reason for the details at a time when there’s lots of industrially produced stuff out there made to look artisanal. Machine produced, the ends of a baguette bear the sharp points that once represented hand-forming; even breads that have megadoses of commercial yeast (you smell it when you open the packaging because it hasn’t burned off) boast flour-dusted exteriors, as if they’ve spent hours slowly proofing in a basket. Bite down, though, and they’re empty. No integrity of flour, process, craft. But I’ll admit that I, someone who can appreciate carb elitism, find myself yearning for more simplicity. I know: Everything artisanal has flavor notes these days, and yet I become queasy when I hear words like terroir applied to wheat. We’re talking about the staff of life—something to make a chicken sandwich with. In fact, that’s what Roxana is going to be doing with her pullman when she and Mattern open Friends & Family in East Hollywood this spring. There’ll be “the Hippie,” a sprouted wheat sandwich with hummus and marinated feta; another will sport smoked sturgeon, horseradish, and pickled onion on rye pullman. I may be the first in line for the breakfast toast with lovage butter, crispy pancetta, and grilled chiles. I find that kind of functionality inspiring. A loaf that took two years to perfect but looks like it’s from a store shelf turns the tables, representing important values while fitting in with the tumult of daily life. The version they use is a five-and-a-half-pound monster. But Roxana will be making a one–kilo pullman for the retail case.